A couple of weeks ago, I posted a review of the Benro Travel Angel TRCB169 and the Gitzo Traveler GT1541T. At the time, I was just curious about these tripods. But, after spending time with the Gitzo, and then going back to my larger and heavy Manfrotto, I knew the writing was on the wall. I had to buy the Traveler! It turned out buying the GT1541T was the easy part. Of course, the Gitzo did not include a tripod head. B&H does have a kit with Gitzo’s G1178M head, but that head only supports 8.8 pounds. The GT1541T supports 17.6 pounds. That doesn’t work. So, I initially purchased my old standard, the Manfrotto 488RC4 which supports the 17.6 pounds. Great tripod head, but too big for this tripod. The tripod legs would not fold and collapse neatly around the Manfrotto head. It created extra bulk which I was trying to avoid. So, back to B&H. I researched the heads from the top brands and narrowed the choice to either the Acratech GV2 or the Gitzo GH1780QR. Both small footprints that support the full weight limit of the tripod. After trying both heads on the tripod, I decided on the Gitzo-Gitzo combination. The GH1780QR is under a pound and has three bubble levels. My only annoyance is the screw-mount on the QR plate. The Manfrotto has a built-in D-ring which is so convenient. The screw-mount requires that you always have a coin or a screw-driver to tighten. After looking around the web, I found the coin-like Pocket Screwdriver by Lee Valley. The edge of the coin varies in thickness to fit a variety of screw slots (from 0.030″ to 0.090″) . You also do not have to worry about passing through Security Checkpoints with this “coin”. At only $9.50 for a bag of 12, it’s a unique bargain. My last issue was finding a convenient way to carry the tripod. Because it is so compact, most tripod bags and straps are too big. But, I then found Manfrotto’s Mini Air Bag. It’s light-weight and fits perfectly. You can see it hanging from the tripod in the above photo. I added the Pocket Screwdriver to the drawstring and I am ready for my next adventure. NOTE – the yellow tag on the tripod was from my Ghost shoot at the Met. Next → Next post: iPhone on Verizon is a Bad Idea! Thanks for this review. I had certain issues with my current tripod. I am using a multidimensional arrow head tripod which is not functioning well. I am searching for something new and I would like to try it soon. This lightweight easy to use Gitzo Traveller Tripod is a piece of performance wonder! Any photographer would benefit from its use! 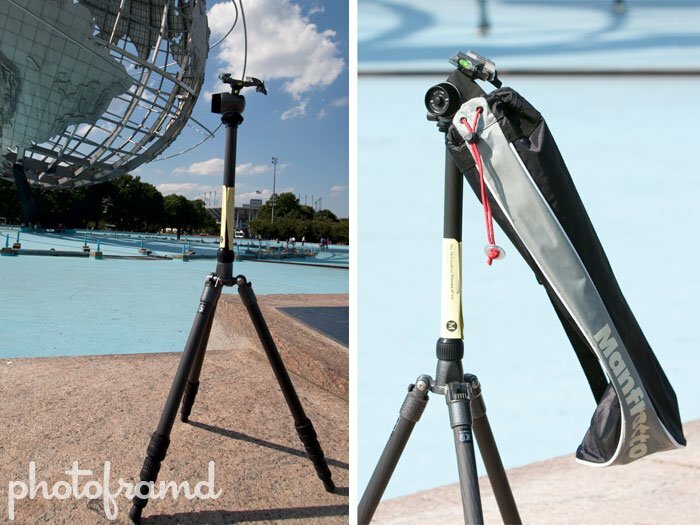 Quick and easy to open tripod reaches heights up to 57″ and only weighs about 2 1/2 pounds! Made from carbon fiber this tripod might out last some cameras!